Someone had good taste when they made this place. Now if only the people matched. Maybe that's why beautiful architecture is necessary -- to distract us from all the people around us. -- Said by Lala after she saw herself in the bad lighting in the bathroom, having just passed an indifferent super model on the way from the pool. "I didn't know the pelvis could get so small," she complained. 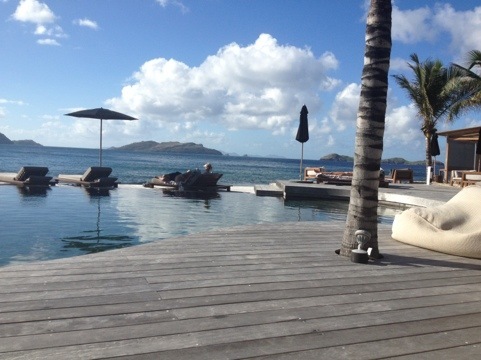 So Laz finally got around to uploading more photos from our little day at The Hotel Christopher on Saint Barthelemy. A day pass cost $120 Euro each and included a lovely gourmet lunch, a drink, a bottle of water, a massage by a pert young French lass, and a totally amazing bed setup by the infinity-edge pool, that overlooks the ocean. For what it’s worth, they give good Oriental Bikini Wax (ancient Chinese secret — I DID NOT SAY IT – My wax girl did) which is quite intimate. Lazslo wanted to show off Lala so chose the center beds, even though Lala had spent all morning being irritable because she felt fat. Laszlo had to pry the chocolate croissant out of her hands at breakfast, as she was threatening to throw it over the wall. “It doesn’t deserve to live after what it and its kind have done to me!” she shrieked. "Lala, can you please get out of the way of my view? You're legs are ruining my view." This entry was posted in hotels, Humor, Laszlo Von Glitz, restaurants, saint barths, St. Barthelemy, travel and leisure and tagged ancient chinese secret, Caribbean, Christopher, Christopher Hotel, gourmet lunch, hotel christopher, jugs, Laszlo, Laszlo Von Glitz, Pain au chocolat, Recreation, Saint Barthélemy, st barth, St Barths, St. Barthelemy, Travel and Tourism by Wednesday Black. Bookmark the permalink.